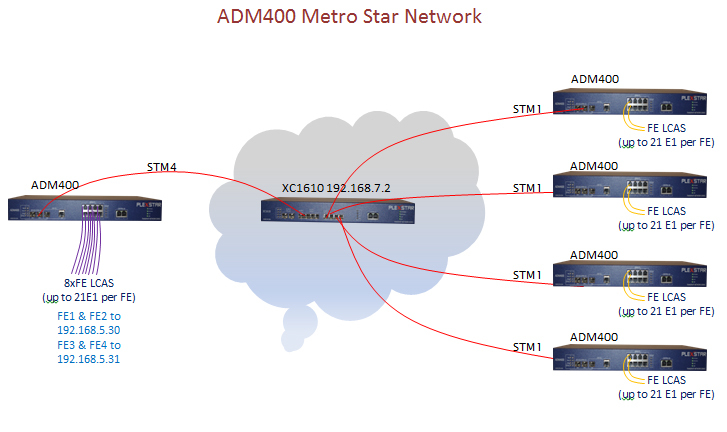 Plexstar ADM400 is a highly integrated solution for OC-12/3 or STM-4/1 add-drop or terminal multiplexers in a compact 1U chassis. Add/Drop GE/FE(8xFE), T1(28)/E1(21) ports into/from SONET/SDH. GE/FE aggregation, Tag base routing, bandwidth policing. GE/FE mode: LCAS/Non-LCAS, Transparent. LCAS, Non-LCAS interworking. GE FE interworking. SDH Payload: VC4-4c, VC4, VC3, VC12. Supports various GE/FE MTU sizes. E1 Mode: PCM30, PCM31, PCM30-CRC, PCM31-CRC, Unframed. T1 Mode: SF, ESF, SLC96. APS Protection: MSP, SNCP, Reverse-SNCP, Ring. Alarm monitoring and reporting via built-in local or network NMS server. Low power consumption (under 20 watts) and cooled by software controlled fans. SMC or SEC compliant timing synchronization with ability to time from line, BITS, T1/E1, or internal reference. Web based secured control and status monitoring. 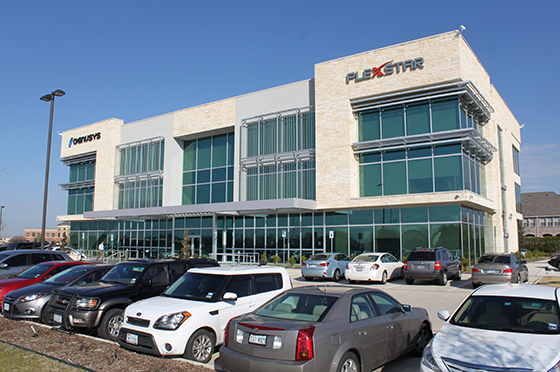 It meets all US Telecom standards. OC12-28T-8F/G for North America OR STM4-21E-8F/G for Asia, Europe and other regions. Two OC-12/3 or STM-4/1 ports. One GE interface via SFP or RJ45. Eight FE ports via RJ45. Two OC-48 or STM-16 ESSI expansion via SATA connectors. Two GE RJ45 control/management ports. 28 T1 or 21 E1 over RJ45. Two external timing interfaces via SATA connectors. Alarms are displayed by location, equipment, port, type, first, last, and number of occurrence, alarm status, acknowledged time, acknowledged by, clearance time, connection identification tag, etc. Alarm can be queried, sorted, cleared, and filtered via the alarm panel. Alarm logs are created and these alarm logs can be deleted upon request. Reported alarms are: LOS, LOF, MS-AIS, MS-RDI, MS-REI, AU-AIS, AU-LOP, AU-RDI, HP-AIS, HP-RDI, HP-UNEQ, HP-TIM, HP-REI, B1-SD, B3-SD, GE/FE DOWN, GE/FE NO PKT, LCAS DOWN, T1/E1 DOWN, etc. Supports higher-order and Lower-order POH, SDH/SONET Level alarms and performance monitoring as Per ITU-T Rec. G.826 and G.784.Supports remote software update. All configurations are automatically saved in the memory so that system will boot from its latest configuration files. These configuration files can be exported to a previously defined server. 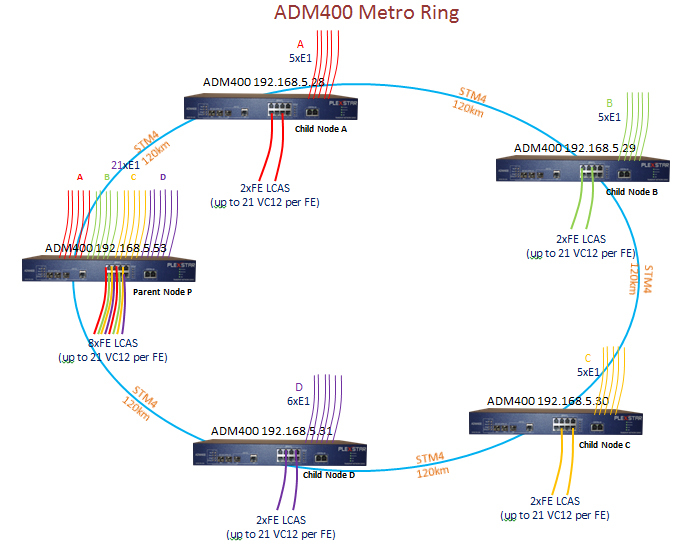 Several diagnostic features are implemented in ADM400 to debug and isolate the fault in the equipment or in the network. This is very useful during new configuration and isolate or pin-point trouble in the connected equipment. Loop-back: Loop-back in VC4-4c, VC4 level, ESSI (backplane) in-loop, out-loop, EOS (GE/FE) in-loop, out-loop, E1/T1 in-loop, out-loop Trace Message: Default trace messages (J0, J1) can be written automatically for each path for connection identification. Overhead: All overhead bypass option, TIM enable/disable option, setting of expected C2 value, etc. 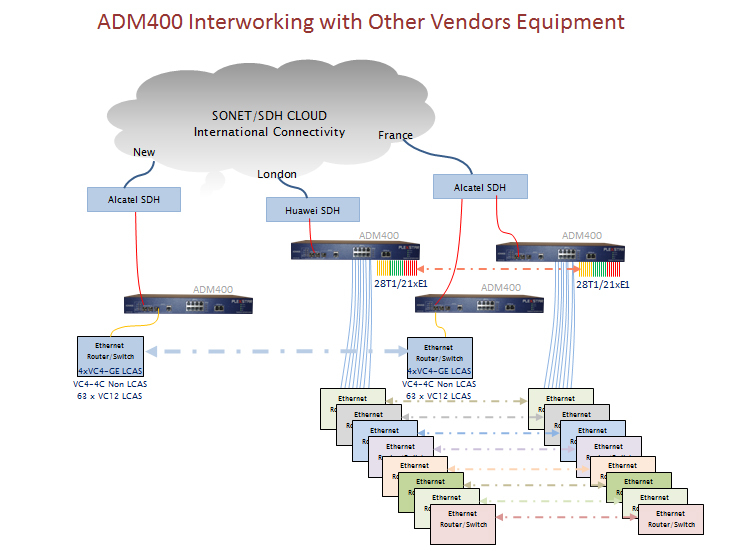 SONET/SDH analyzer function is implemented in each SFP1 and SFP2 ports for which bulky test sets are no longer required to be carried in the job site. Line (RS), Section (MS), and Path (HP) level overhead read/write capability is available for testing and configuration with option to bypass transparently if required. Trace messages can be read or written in line, section, and path level (J0, J1, and J2). RS/Section overhead can be read or written: J0, Z0, B1, E1, F1, D1-D3. RS Alarms: LOS, LOF, OOF, BIP (B1). MS/Line overhead can be read or written: B2, D4-D12, S1, E1, K1, K2, Z1, Z2. MS Alarms: MS_AIS, MS_RDI, MS_REI, BIP (B2). HP/Path overhead can be read or written: B1, C2, F2, G1, H4, Z3, Z4, Z5. HP Alarms: BIP (B3), REI, RDI, UNEQP, PLM, LOP, TIM. Path overhead can be bypassed for transparency. 1+1 MSP between SFP1 and SFP2. SNCP: A single VC (or VG group) from SFP1 or SFP2 is protected via two (working and protected) FE or E1 ports. SNCP SFP-E1: There are 7 groups of SNCP SFP-E1 (Group-1 to Group-7) can be configured simultaneously in revertive or non-revertive type. Here one or group of VC12 paths is routed to a working and a protected E1 port. Can be enabled/disabled later after configuration. SNCP E1-E1: There are 7 groups of SNCP E1-E1 (Group-1 to Group-7) can be configured simultaneously in revertive or non-revertive type. Here one E1 is routed to a working and a protected E1 port. Can be enabled/disabled later after configuration. Group Enable Disable: Above groups can be enabled, disabled or removed separately after configuration. Reverse SNCP: One FE or E1 port is protected via two VCGs (working and protected) in SFP1 and/or SFP2. Rev SNCP E1-SFP: Rev SNCP E1-SFP can be configured for all E1 ports in revertive or non-revertive type. Here one E1 is routed to a working and a protected VC12 path in SFP1 or SFP2. Can be enabled/disabled later after configuration. Rev SNCP (E1-SFP) Enb/Dis: Above Rev SNCP can be enabled, disabled or removed separately after configuration. Rev SNCP FE-SFP: Rev SNCP FE-SFP can be configured for all FE ports in revertive or non-revertive type. Here one FE is routed to a working and a protected VC12 path (one or group of VC12) in SFP1 or SFP2. Can be enabled/disabled later after configuration. Supports timing synchronization options from the SONET/SDH lines, a BITS T1/E1 interface, any of the T1/E1 recovered clocks, or an internal reference. A combination of a digital PLL and an analogue PLL is used to meet the system requirements for synchronization, holdover and jitter. It meets the ITU-T G.812 and G.813 timing requirements for STM-1 and STM-4. It also meets the Global timing requirements for OC-3/STM-1 and OC-12/STM-4. Selection between these two is configurable via software. MSPP solutions in a compact Pizza box. Better utilization of available rack space. Supports grooming up to VT1.5 or VC12. Operates over a wide temperature range.